The CRRC is an excellent resource for building owners who are looking for information and benefits on cool roofing, types of cool roof products, articles, rebate information and more. The main objective of the CRRC is to provide credible ratings for solar reflectance and thermal emittance of new and aged cool roofing materials – view their large rated products directory. Click here for a list of AcryShield CRRC rated products. Energy Star provides a directory of roofing products that save money and energy by reducing the amount of air conditioning needed to cool a building. They focus on cool roof products that reduce energy consumption and peak cooling demand. Click here to view Energy Star Compliant AcryShield Roof Coatings. For Large Buildings: U.S. Department of Energy’s Oak Ridge National Laboratory estimates energy and peak demand for large facilities with flat roofs that do not have a black surface. For Small to Medium Sized Buildings: U.S. Department of Energy’s Oak Ridge National Laboratory estimates cooling and heating savings for smaller facilities with flat roofs that do not have a black surface. R.E.S.T. (Roof Energy Savings Tool) - REST software is an innovative and comprehensive modeling tool developed by National Coatings to help building owners and facility professionals evaluate various roofing systems in terms of their impact on building energy use. National Coatings has a group of roofing contractors who are approved applicators for Cool Roof Coating Systems. These contractors have excellent reputations among other contractors, building owners and suppliers. They have consistent records of high quality applications of Cool Roof Systems and are recognized by roofing organizations. Contact us for an approved applicator in your area. If you are interested in joining our team of highly recommended Cool Roof Coating applicators, click here. DSIRE is funded by the U.S. Department of Energy and provides a great search tool for incentives for renewables and efficiency based on your state/location. What’s the Difference between a “Cool Roof” versus a “Normal” Roof? Should I Install a Cool Roof Coating System? 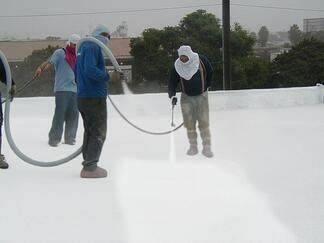 Cool roof coating systems are roofs with a reflective surface. They reflect most of the sun’s heat and absorb only a very small amount of the warmth, allowing the building to maintain a cooler temperature. Cool roof coating systems can be applied over a new roof or an existing roof – converting a previously black surface or non-reflective surface into a cool roof. A great benefit of cool roofing is that they are cost effective. Coating an aged and deteriorating roof provides energy cost savings and lengthens the lifespan of your existing roof. Depending on the cool roof system you choose, you can renew and restore your roof every 10 or so year, avoiding an expensive roof tear-off indefinitely. Coating a newly constructed roof that is not reflective, can add additional cost to make it a cool roof, but the benefits are worth it. Extended Roof Life – reflective roof surfaces add extra protection to your roof, lowering roof maintenance and protecting your roof from the single most destructive element – the sun’s heat. 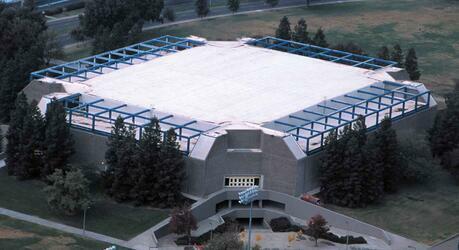 Wondering if your building would benefit from a cool roof coating system? National Coatings developed a Roof Energy Savings Tool (REST) to help building owners and facility professionals determine and evaluate their current roofs energy usage compared to a cool roof system. This allows you to determine the cost savings and benefits your specific building would gain if you were to install a cool roof coating system. For a comprehensive analysis of your current roof, contact National Coatings today! Our Cool Roof Jargon whitepaper helps clarify cool roofing terminology and questions you may have, download it today for FREE! Cool Roof Coatings Versus Black Roofs – What’s the Big Deal! National Coatings has conducted several tests in their lab, as well as, had their cool roof coatings tested by the Cool Roof Rating Council (CRRC) and several other independent, non-biased organizations to determine and evaluate the results of their roof coatings against the sun’s destructive heat. These tests have proven white roof coatings or cool roof coatings compared to un-coated, black rooftops provide building owners and tenants with significant benefits. A white surfaced, cool roof coating system with 100% of the sun’s radiated heat projected onto the roof top will absorb approximately 8% of the heat while immediately reflecting 92% of the sun’s heat back into the atmosphere, away from the roof. (These results are proved results based on using our AcryShield Ultra High Reflectance A590 roof coating.) This guarantee’s a cooler indoor ambient air temperature without any air conditioning usage. An un-coated, black roof surface with the exact same scenario absorbs 69% of the sun’s heat. That is 61% more heat absorbed into the building compared to the cool roof surface. Black roofs are only able to reflect 31% of the sun’s heat away from the building, causing the inside of the building to heat up much quicker, requiring a larger amount of energy consumption to cool the building. This added heat absorption also leads to premature aging as the roof surface dries out and becomes brittle much quicker, losing it’s ability to expand and contract with the building during temperature changes. Harbor Freight Tools in Camarillo, California experience this exact situation. They had a black BUR roof and restored it to new (avoiding a costly tear-off and business closure during application) with a Cool Roof Coating System and very impressed. After the National Coatings' Cool Roof was installed we definitely noticed a difference in building temperature. It's not a marginal difference, either. It is between 15-20 degrees cooler inside the warehouse and store." - Jerry Moore, Facilities Director at Harbor Freight Tools. Click here to read their full Case Study for more information!